When thinking of the Pacific Northwest, Seattle and Portland are the two cities that come immediately to mind. However, there are other places in Washington and Oregon that are also good choices for visitors who don’t want to drive. Best of all, they are likely to be less crowded and more compact than larger cities. In this month’s Car Free Journey, we will spotlight one of these too-often-overlooked getaway cities: Spokane, Washington. Spokane has an average of 260 days of sunshine, is close in the midst of the outdoors and has a walkable city center. It is a great choice for visitors who don’t want to drive as much of what you need is accessible on foot or bike, and anything outside of downtown can be easily reached by public transportation. Let’s begin our Car Free Journey. Spokane is the largest city in Spokane County of which it is also the county seat. It is the fourth largest city and metropolitan area in the Pacific Northwest region. The city is located on the Spokane River in eastern Washington, 92 miles south of the Canadian border, approximately 20 miles from the Washington-Idaho border, and 232 miles east of Seattle. According to the 2010 Census, the city of Spokane has a population of 208,916. The Spokane Metropolitan Statistical Area (including Spokane, Stevens and Pen Oreille counties) has a population of 532,253. The city’s name is drawn from the American Indian tribe known as the Spokane, which means “Children of the Sun” in Salishan. Spokane’s official nickname is the “Lilac City” for the flowers that have flourished since their introduction to the area in the early 20th century. Spokane has three major claims to fame. It is known as the birthplace of Father’s Days; it hosted the first environmentally themed World’s Fair, Expo ’74; and Spokane was awarded the All-America-City award by the National Civic League in 1974 and 2004. Spokane’s most prominent neighborhoods are Riverside, Browne’s Addition, and Hillyard. The Riverside neighborhood consists primarily of downtown Spokane and is the city’s central business district. The neighborhoods south of downtown Spokane are generally known as the South Hill. Downtown Spokane attractions include City Hall, Riverfront Park (the site of Expo ’74), the Spokane Convention Center and INB Performing Arts Center, Mobius Center, and the Spokane Arena. Browne’s Addition, west of downtown, is one of Spokane’s oldest and densest neighborhoods and is a National Historic District. The Northwest Museum of Arts and Culture (a Smithsonian affiliate museum) houses a large collection of Native American artifacts as well as regional and national traveling art exhibits. It is in a secluded setting, just a few blocks from downtown Spokane. In northeast Spokane the downtown Hillyard Business District, located on Market Street, became Spokane’s first neighborhood to be listed in the National Register of Historic Places. Many of the town’s early residences were built to house railroad workers. Hillyard still caters to new arrivals, becoming a popular home for Spokane’s growing Russian, Ukrainian, and Southeast Asian communities. The Mobius Science Center and the related Mobius Children’s Museum in downtown Spokane provide the public with innovative ways to learn about science, technology, engineering, and math, including hands-on experience for young people. Spokane also hosts a variety of visual and performing arts scenes. These include a major civic theater as well as several smaller ones, such as the Spokane Symphony. The Davenport District is also home to many art galleries as well as some of Spokane’s main performing arts venues. The Metropolitan Performing Arts Center was restored in 1988 and in 2006 was renamed Bing Crosby Theater in honor of Spokane native Bing Crosby. The Martin Woldson Theater at the Fox, which has been restored to its original 1931 art deco state, is the home of the Spokane Symphony. If you visit the last weekend in June (June 28-29), stop by Spokane Hoopfest (http://www.spokanehoopfest.net/Pages/default.aspx) in downtown Spokane which claims to be the largest 3-on-3 basketball tournament in the world. Hoopfest is more than just a basketball event, including live music in Riverfront Park, along with merchandise and various food tents. The only requirement for entry in the tournament is that players must be entering at least the third grade in the fall following Hoopfest. Spokefest (http://www.spokefest.org/) cycling festival is held each September and use a route that takes bicyclists through the scenic Spokane River Gorge. THe event offers alternative routes of various distances along with a family “Spokefair” in Riverfront Park. The Spokane International Airport (GEG) serves Alaska Airlines, Allegiant Air, American Airlines/US Airways, Delta Air Lines, Frontier Airlines, Southwest Airlines and United Airlines. To get from the airport to downtown Spokane, take Spokane Transit Authority’s bus route 60 which will travel from the airport and end at the bus plaza downtown. The plaza is within walking distance of most hotels. The 60 runs hourly. Two bus companies: Greyhound and Northwest Trailways also stop at the Intermodal Center. Northwest Trailways provides daily service to and from Boise (Idaho) and Seattle. If arriving in Spokane by train or bus, STA’s Spokane Transit bus 90 operates every 15 minutes and travels to both the Spokane Valley and the downtown core. While many neighborhoods are accessible without a car, downtown Spokane is the ideal place to stay for visitors who don’t plan to drive. Hotels, restaurants, shopping, entertainment and parks are all within walking distance. The bus plaza is centrally located if a visitor desires to travel outside of downtown. To get around the area without a car, visitors can walk, take the bus or ride a bicycle. 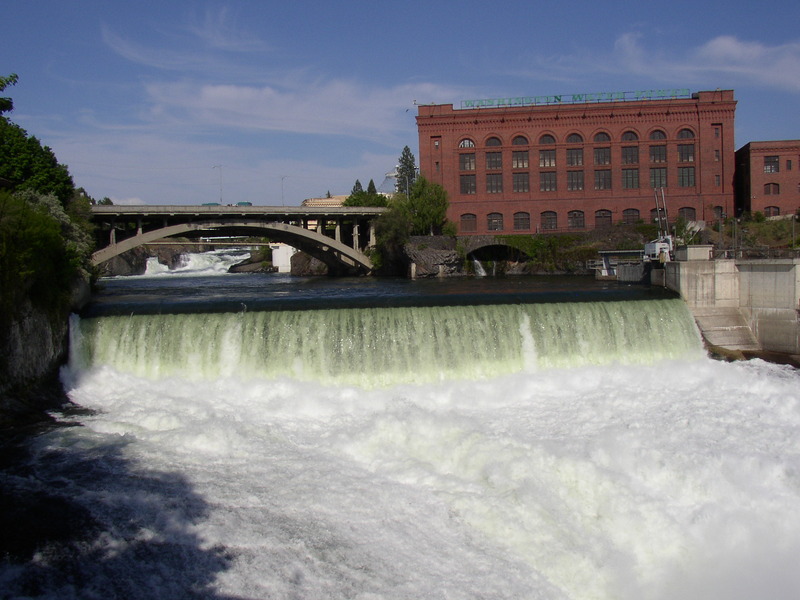 The area that is the best to visit if a visitor just wants to settle in for the weekend is downtown Spokane, as it has the most to offer in accommodations, dining, nightlife, shopping and recreation. A single fare is $1.50 for ages 6-64, $.75 for senior over 65 and persons with disabilities. A one-day pass, for unlimited bus trips on a single day, costs $3.50 and you can buy it on the bus. Spoke ‘N Sport (http://spokensportinc.net or call (509) 838-8842) is a great place to rent a bike, since it is located downtown. The Centennial Trail is just minutes away from the shop and is a 37-mile paved trail that stretches from Riverside State Park to the Idaho border. (http://spokanecentennialtrail.org). Riverfront Park, created after Expo ’74 and occupying the same site, offers 100 acres of green space in downtown Spokane and is the site of some of Spokane’s largest events. The park has views of the Spokane Falls, a 5-story IMAX theatre, and is home to the historic Riverfront Park Looff Carousel, created in 1909 by Charles I. D. Looff. The carousel still operates in Riverfront Park, where riders can participate in an old-time ring toss. The park’s Sky Ride gondola lift carries visitors across Spokane Falls from high above the river gorge. To get here by bus, take Spokane Transit bus 22, 23, or 24, and get off at the Library at Lincoln and Spokane Falls Blvd. 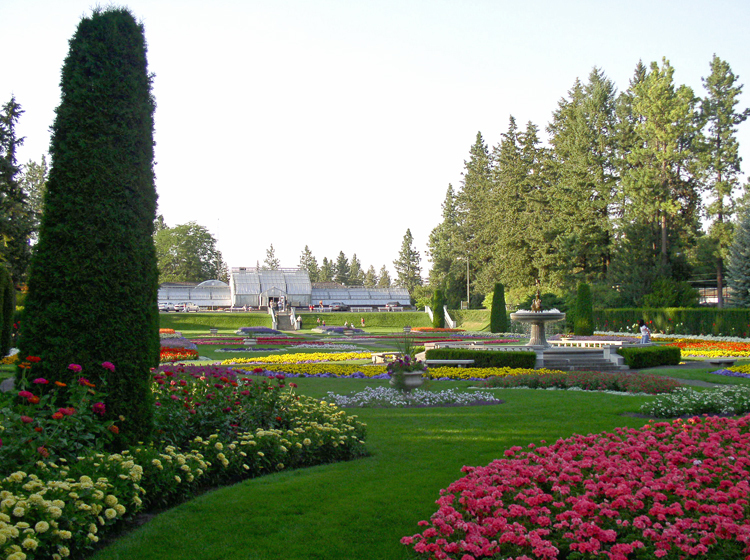 Manito Park was built by the famous Olmstead brothers who created New York’s Central Park and many other city parks throughout the United States. Manito Park and Botanical Gardens, on Spokane’s South Hill, has a duck pond, a central conservatory, Duncan Gardens, a classical European Renaissance style garden, and the Nishinomiya Japanese Garden designed by Nagao Sakurai. To get here by local bus, take either: Route 44g 29th Ave, Stop on Grand Blvd and 18th; or 44b 29th Ave, Stop on Bernard and #20th. The Mobius Science Center and the related Mobius Kid’s Museum in downtown Spokane seek to provide the public with new and innovative ways to learn about science, technology, engineering, and math, including a hands-on experience for young people. The Northwest Museum of Arts and Culture (a Smithsonian affiliate museum) houses a large collection of Native American artifacts as well as regional and national traveling art exhibits. It is in a secluded setting, just a few blocks from downtown Spokane. Find out about more attractions and activities at http://visitspokane.com/things-to-do. #60 Airport/Browne’s Addition or #61 Highway 2/Browne’s Addition, Stop at Pacific and Cannon, near The MAC (Museum of Arts and Culture). Visit Spokane recommends two free self-guided walks, plus food ($49) and wine ($59) tours. Spokane is great for bicycling! Spoke ‘N Sport is a great place to rent bikes and their store front is located in downtown Spokane and is easily accessible by walking. The Centennial Trail is by far Spokane’s biking trail gem. Two other ideas: Riverside State Park is a 15-minute ride along the Centennial Trail. The Fish Lake Trail is at the other side of downtown Spokane, and a 15-minute ride from Spoke ‘ Sport. For more information about bike trails, ask a staff member at Spoke ‘n Sport. They are all avid bicyclists. For public transportation, visit spokanetransit.com or call (509)-328-7433. Do you have a favorite vacation spot that can be enjoyed without a car? E-mail your ideas to steveatlas45 [at] yahoo.com. Please include your contact information so Steve can get back to you with any questions. This entry was posted on Monday, April 28th, 2014 at 6:40 pm and is filed under Car Free Journey. You can follow any responses to this entry through the RSS 2.0 feed. You can leave a response, or trackback from your own site.